We just found out last night that our neighbor of MANY years had passed away and I was REALLY shocked when my husband asked me to make the family a card. He thinks I just "play" with all these rubber stamps and never do anything with them. I think he will be shocked when he sees what I have done. I'm pretty proud of it. I think it turned out pretty well. I used my favorite "Our Daily Bread Designs" stamps from the "Flourished Christian Symbols" set. I find that is really my 'go to' set for happy times and sad. It is such a PRETTY set. 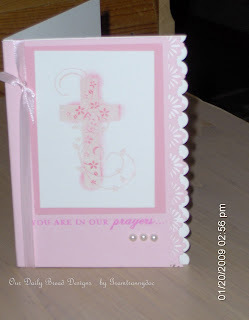 Recipe: SU pink pirouette cardstock, ww cardstock, Pixie pink cardstock, Fiskars edge punch, SU scallop edge punch, self adhesive pearls, Michaels ribbon, Pirouette pink ink, clear embossing powder, regal rose sponged over the cross and Color Box Orchid used for the Sentiment. This card is beautiful Ol' guy really knows your talent, but you know MEN! I miss you too and I hope to get my blog repaired. Thanks for your kind comments and your help and love. This is beautiful. Very tasteful. This is such a lovely and soothing looking card. The soft colors are sweet and the scallop edge is a wonderful touch! It's always hard to make sympathy cards. Sorry to hear about the loss of your friend/neighbor. I am a wife, mother to 3 girls and step-mother to 3 girls and 1 boy. We have 17 grandchildren and 3 great granddaughters. I am married to the love of my life and we live on an acreage out in the country. Life is Grand. I am also a Stampin' Up! Demonstrator and would love to help you unleash your creativity!